Considering an EHR Purchase or Replacement can be overwhelming. Your practice needs a solution that will result in increased efficiency and staff satisfaction while reducing costs. While this process may feel daunting, it shouldn’t. 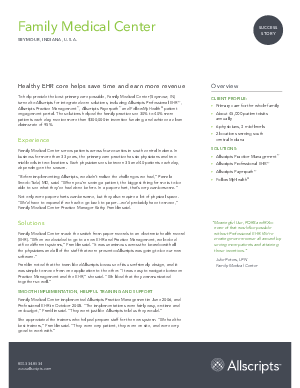 Learn about Family Medical Center’s selection and implementation process of the Allscripts solution, as well as how their EHR is helping them achieve their goals and increase revenue.